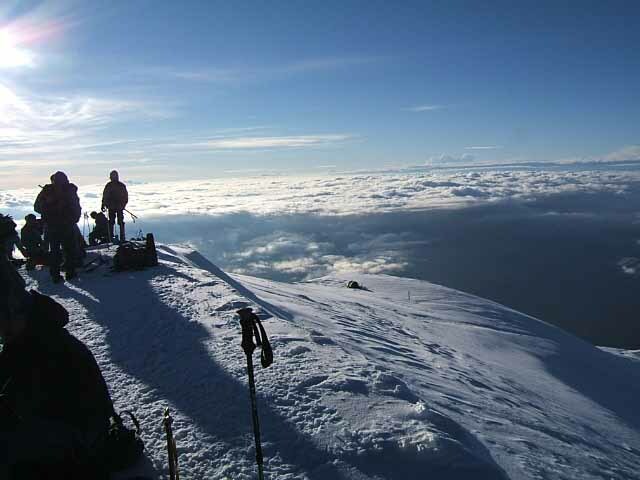 Mont Blanc, the highest summit in Western Europe at 4807 metres. It towers over the Alps and provides spectacular views from the summit. 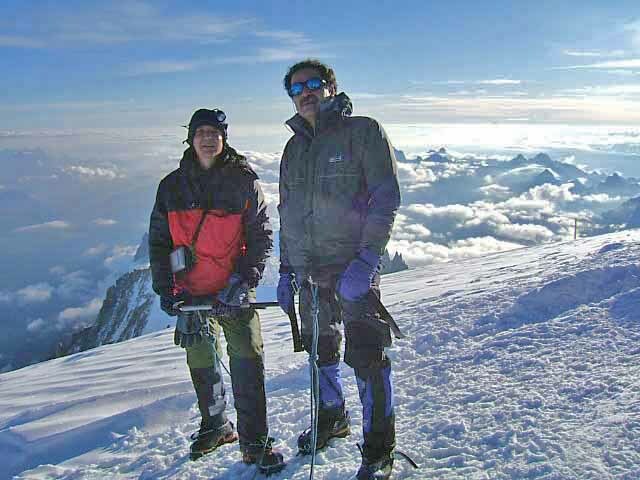 Climbing Mont Blanc is one of the great challenges in the Alps and a reasonable level of fitness and adequate acclimatisation is required. 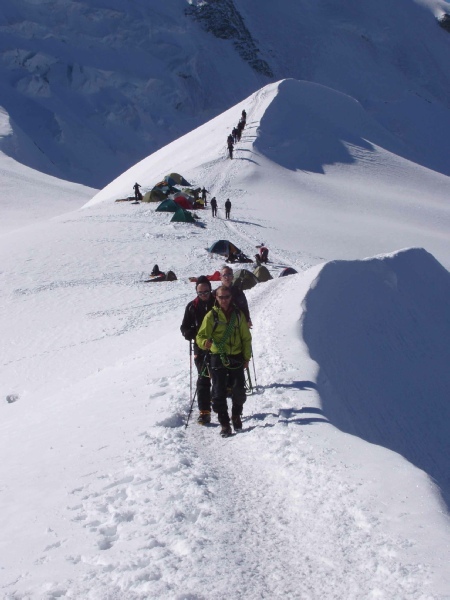 The trip was organised through KE adventure travel in Keswick and consisted of one ice skills practice day, 3 days acclimatisation followed by a 2 day ascent and descent of Mont Blanc. Trip members were Anoosh and David. Further photographs are available here. 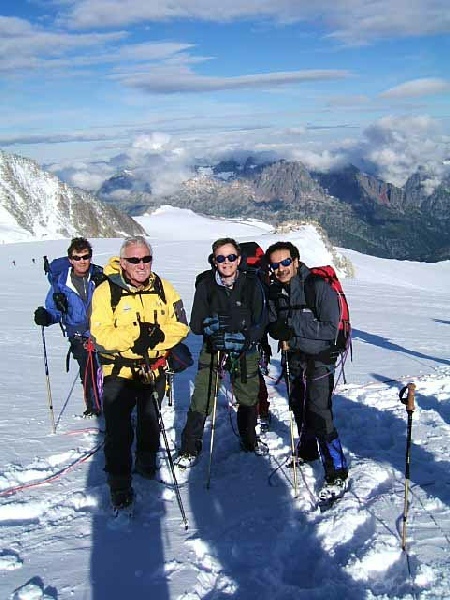 A DVD of the expedition is available for those planning to climb Mont Blanc. The old rack and pinion railway was taken from Chamonix to the edge of the Mer de Glace. 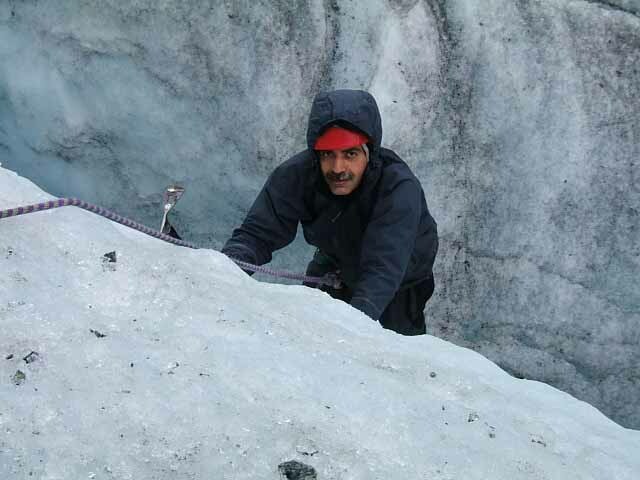 The descent to the Glacier consisted on a series of steep ladders and once onto the ice, crampons and ice axes were made ready for some practice. Crevasses were climbed in and out of and some steep ice climbing was attempted. After an early lunch, the cable car was taken from Le Tour to the Col de Balme (2130m). 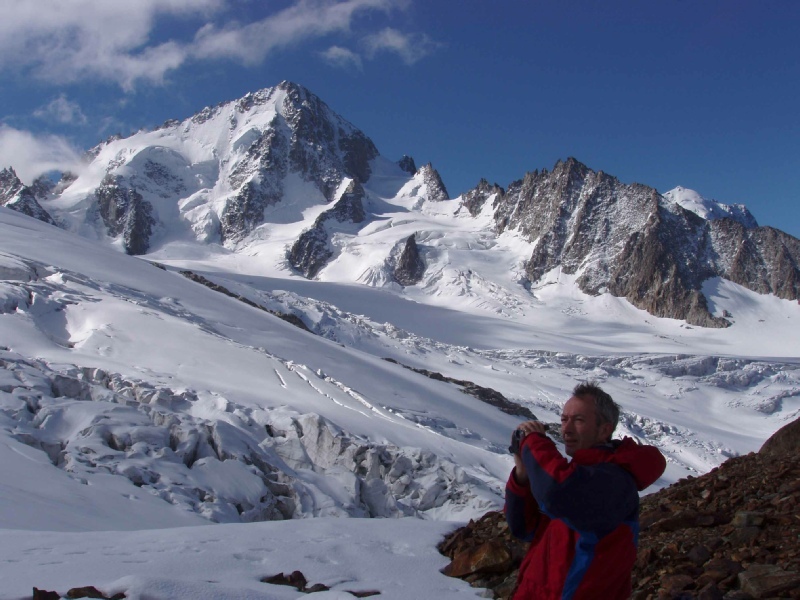 The path along the Glacier de Tour was taken for about 2 hours to the first of the mountain refuges, the Albert Premier Hut. The weather was overcast so there was no chance to sunbathe on the terrace outside the Hut. Our first Alpine start, at 5am, saw us onto the glacier above the Albert Premier Hut. Crampons were strapped on and we started up towards the col beneath the Petite Fourche (3520m). The weather was variable, bright and sunny at times, then snowy with very limited visibility at others. The scramble to the summit was somewhat congested with a number of different parties jostling for position. After the descent from the summit and with the weather closing in, an abseil down an ice wall took us into Switzerland. The wonderful Plateau de Trient was crossed and after a final ascent, we were safely lodged at the Trient Refuge(3170m). A huge lunch of rosti potatoes was followed by a welcomed siesta. Another early start, after a good breakfast, saw us back on the Plateau de Trient. The weather had cleared during the night and dawn was soon followed by wonderful blue skies. The Aiguille de Tour was a good scramble but cloud had formed by this time to spoil the view. A rapid descent took us over a col and back to the Albert Premier Hut for coffee and cake and then the walk back to the cable car. The drop off point at Les Houches, was a short drive down the valley from Argentiere where we were staying. A cable car and a train took us to Nid d'Aigle (2372m). A rocky trail lead to the newly built Tete Rousse Hut (3167m). Lunch at the Hut was followed by the ascent to the Gouter Refuge across the Grand Couloir. 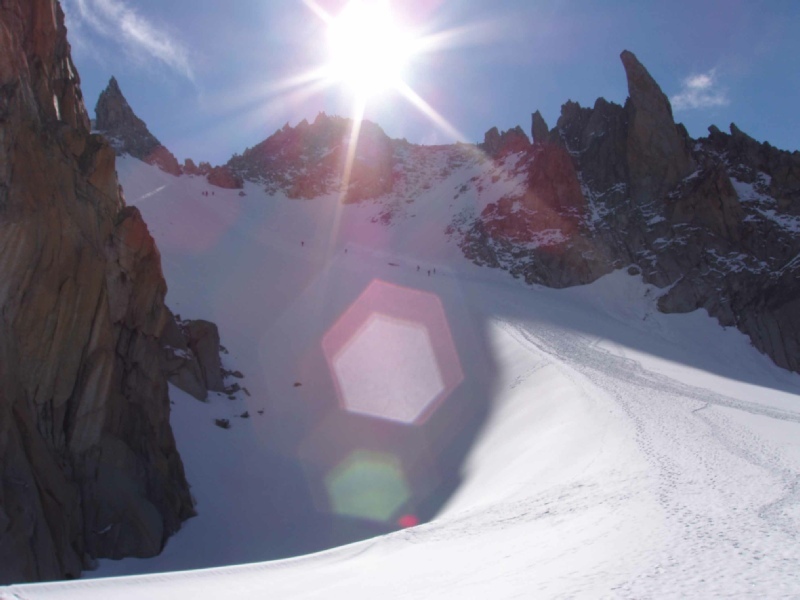 Crossing the mouth of the Couloir was an experience not to repeated too often in a lifetime. The speed that rocks screamed down past the traverse was a cool reminder of the dangers of this route to the summit. The scramble up the arête of the Couloir was fun but not difficult. The day started at 1am with a mad scramble to find all our gear and get dressed for the ascent. We left the hut at about 2.30 am to join the stream of head torches snaking towards the Dome de Gouter. The weather was good, not too cold and with little wind. The ascent was not steep and the snow crisp beneath the crampons and boots. The shoulder on the Point Bayeau and the broad expanse of the Col du Dome were crossed until we reached the Refuge-Bivouac Vallot. Our guide was a bit cold at this stage and decided to go into the Refuge to put an extra layer on. A number of climbers were sleeping in the Refuge when we clambered in through the hole in its floor. It is a truly miserable place to spend any time and we both glad to emerge from its belly back on the ascent. The ridge above the Refuge steepens and narrows to the Bosses Ridge. The dawn had now started, highlighting the Aguille de Midi in wonderful purples, as the sun rose. The ridge is a perfect line on to the summit whaleback and we were soon stood celebrating with other members of the party on the highest point in France. 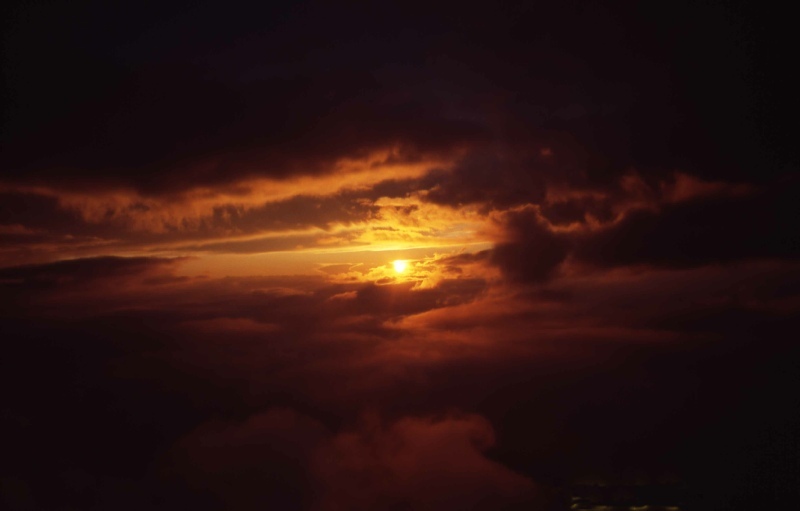 The views from the summit were stunning with excellent visibility. 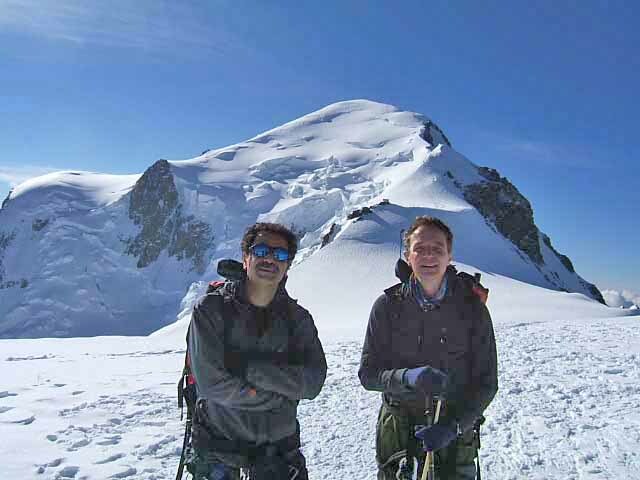 The Matterhorn was clearly visible in the distance and nearer peaks such as the Aiguille de Midi and the frontier ridge to the Grandes Jorasses were truly inspiring. This is truly one of the greatest and most beautiful mountain landscapes and one to savour. After about 20 minutes on the top, we retraced our steps down the ridge. The snow conditions had deteriorated a bit but the snow was still reasonably firm. The Refuge was passed and the Dome du Gouter descended. A late breakfast in the Gouter Refuge refuelled us, ready for the scramble down the arête and safe crossing of the Grand Couloir stone shooting gallery. Out of the grip of the Couloir, we were soon on our way back to the train station at Nid d'Aigle. For us, the trip was a fantastic success and we had both enjoyed it immensely. Our chosen peak was done and we were happy - very happy - the whole experience had been fun. Many thanks to Robbie for a safe and steady climb to the top.